Posted on Tue, Nov 23, 2010 : 8:46 a.m.
Graeme Taylor was thrust into the national spotlight last week when the openly gay Ann Arbor teenager gave a moving speech to the Howell school board. But it wasn't something he rehearsed, the Pioneer High student told Ellen DeGeneres on her show Monday. 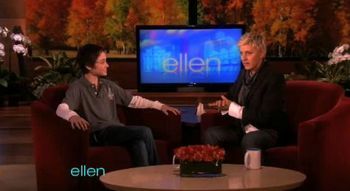 Ann Arbor Pioneer student Graeme Taylor appeared on the Ellen DeGeneres show Monday. After hearing the story of Howell teacher Jay McDowell, who was suspended for a day without pay after he ejected two students from his classroom on Oct. 20 for what he judged to be anti-gay remarks, Taylor and others from the Neutral Zone drove to the school board meeting. "I began to speak and slowly just thought of anyone who has been tormented or had such a hard life, and the rest just came out," Taylor told DeGeneres. Taylor also discussed self-acceptance, telling DeGeneres: "It takes time to get comfortable with yourself." "Yeah, I know," DeGeneres, who is openly gay, quipped back. And Taylor, 14, told the story of revealing to two friends he is gay at the age of 13. He said he felt he needed to tell them, got flustered and walked into a closet. As he emerged, he announced, "'Guys, I'm gay,' without really thinking about it. I literally came out of the closet." At the end of the nearly four-minute segment, DeGeneres presented Taylor with a $10,000 scholarship from tonic.com. An article on the tonic.com website explains, "Ellen called and we proudly stepped up again. Our latest campaign not only supports a courageous, young anti-bullying advocate, but has also inspired us to make Tonic Campaigns a regular occurrence." Meanwhile, the controversy continues in Howell. The district last Wednesday released statements from students who said McDowell was the one who ignited the situation in his classroom and yelled at the students, called them racist and slammed doors. McDowell denied those allegations. The Howell Public Schools teachers union released a statement Thursday criticizing the school board and district officials for what it called inaccuracies and character attacks on McDowell. Sat, Nov 27, 2010 : 8:44 p.m.
Congratulations to young Mr. Taylor. He showed a great amount of courage. He is to be commended. Fri, Nov 26, 2010 : 10:19 p.m.
Don't speak too loudly about the wonderful Neutral Zone. The extremists will come after it like they do anything that is civilized and worthwhile! If anyone ever told you that you couldn't marry the one you love, only then might you get a clue of what discrimination feels like. Heterophobia is as silly as the imaginary war on Christianity! Fri, Nov 26, 2010 : 9:34 a.m.
How do we know Graeme taylor wants to go to college? Maybe they should have just given him the 10 thousand in cash. You can buy alot of skateboards with 10 grand! Fri, Nov 26, 2010 : 9:19 a.m.
@Briegle Oh Yea? Where is the ACLU now? How come they havn't filed a suit on behave of those students? Perhaps they feel a one day suspension is enough for violating these kids 1st amendment protections. I got a longer suspension for smoking in the boy's room. Fri, Nov 26, 2010 : 8:52 a.m.
Thu, Nov 25, 2010 : 8:48 p.m.
Mike, don't worry, your beloved ACLU will always protect even your First Amendment rights! Thu, Nov 25, 2010 : 10:09 a.m. Thank you Robyn and Matt Cooper for getting to the heart of the matter. Wed, Nov 24, 2010 : 8:59 p.m.
Bravo! Here's hoping that hetrophobia becomes extinct, and the 1st ammendment of the Constitution can make a comeback! Wed, Nov 24, 2010 : 7:06 p.m.
Bravo! Here's hoping homophobia goes extinct. Wed, Nov 24, 2010 : 2:19 p.m.
graeme received a scholarship for "standing up" for a teacher who is against religious freedom and loses his temper if one of his students doesnt agree with his own beliefs. the teacher disciplines 2 students for "standing up" for their own beliefs. there was no bullying, no hate, and no anger shown by anyone except for the teacher. the gays are the ones who stir the pot and expects everyone to support their immoral lifestyle. Wed, Nov 24, 2010 : 12:56 p.m.
Scooby this young man tried to take his life because of fear- look how far he has come and please know he has helped other young kids not be afraid! Whats disgusting is people so judgmental and cold hearted that attack a 14 years old because something was given to him for what he did right. Who are you to say Ellen hasn't given even more to the homeless. Remember not to judge others, because you are not perfect either!!! I am proud of this young man for his courage, strength he has displayed!!! Wed, Nov 24, 2010 : 11:52 a.m.
@robyn, I the drug user can stop using drugs. It's a behavior. The abuse is a behavior. Cheating is a behavior. Being gay is WHO you are. You can be gay and celibate, just like you can be straight and celibate. It's like race. A black person can't stop being black. You must accept them, like it or not, because to do otherwise is to deny their humanity. GLBT is the same as race, it's how people are born, WHO they are. Not a behavior. Wed, Nov 24, 2010 : 10:01 a.m.
RoboLogic -- sure, I think you scenario would have been a good choice, depending on how things were going. I wasn't there, but I'm guessing it's possible that the teacher found the offending student... shall we say... closed off to the possibility of a teachable moment? Maybe attitude and swagger entered this teachers' decision-making at that moment? Maybe the teacher saw the possibility of escalation and chose this option as the best way to defuse? I'm willing to give a veteran teacher the benefit of the doubt here. Wed, Nov 24, 2010 : 9:47 a.m. This headline should read...Howell teacher yells, slams doors, calls his students racists, and kicks 2 students out of class for their religious beliefs. Then, student from another school supports crazy acting teacher and receives scholarship. Oh wow! I just wrote the whole actual, untwisted story. Wed, Nov 24, 2010 : 8:58 a.m.
Alternate scenario..... What if? What if the teacher did not kick the student out of class but instead had a discussion about respecting the rights of others who may be different from each other? Getting the students to express their feelings on an equal platform. The point is that both students (Taylor and the anti-gay student) both have the right to exist without persecution. Can middle ground be found here? Not until closed minds open themselves a little. Wed, Nov 24, 2010 : 8:38 a.m.
@robyn -- wrong. Saying you don't accept someone is totally dehumanizing them. It is, in fact, "bad." Wed, Nov 24, 2010 : 1:26 a.m. Since this whole thing started over a teacher demanding a student remove a Confederate flag, belt buckle, wouldn't it be interesting to see if the reaction from the "forward thinking," "progressive" types would have been different if the article of clothing had been, say.....a Che Guevara T-shirt? Are those T-shirts still considered "high fashion" in Ann Arbor? Have they gotten over their infatuation with Murdering, Stalinist thugs, yet? Are we all "Trotskyite's now? I've always wanted me one of them Che Guevara T-shits. but not the one of him as a Rock-star. I'd rather have one with the picture of Che, in Bolivia.....on the slab. I bet that would realy turn some heads at the "Grizzly Peak." Wed, Nov 24, 2010 : 12:21 a.m.
You should not be offended by the often used remark that Christians use against others with whom they disagree as they attempt to end the debate from a superior position! Heaven is for good Christians and damnation to an eternal Hell is for the rest of us. Right? Maybe A2.com could answer your last question with the type of comments they delete! Not always promptly. Tue, Nov 23, 2010 : 10:06 p.m.
Love the Christian, hate their intolerant sin! Tue, Nov 23, 2010 : 9:46 p.m.
Tue, Nov 23, 2010 : 9 p.m.
Ok, let's be clear on a couple points: 1. Some of you point out that Howell was at one time associated with the KKK. Fact is, that was nearly 30 years ago, and it wasn't in fact Howell that the state KKK leader resided in. So that point is moot and has absolutely nothing to do with this story. Get over it. 2. This whole situation wasn't about gay rights, gay pride or anything related to gayness in general. It started out as an anti-bullying day against bullying of ALL people, not just gay people. 3.This "teacher" MADE it a gay issue because two students dared question him about why they couldn't wear the confederate flag. This "teacher" then turned the conversation to the discussion of gay rights. This "teacher" then kicked a student out because he stated his belief that "I can't accept gays because it's against my religion". 4. The "teacher" than inflamed what was already a bad situation (which he himself initiated) by using his position as "teacher" to slam doors, yell at the two students he had kicked out and discuss what disciplinary measures he wanted taken in front of the entire class. Sounds a lot like the bullying he was railing against, doesn't it. 5. The "teacher" then used his position as president of the HEA to threaten and attempt to coerce the school board to reverse their disciplinary action against him ( more bullying. So much for the anti-bullying stance he took in the classroom). 6. Finally, Graeme Taylor goes to Howell to speak to the board for no other reason than to protest for gay rights, in a situation wherein he had no facts about what really happened, no information about the misconduct of the "teacher" and no standing in the situation whatsoever (this was a Howell schools issue, Graeme attends Pi Hi in Ann Arbor) other than being himself gay. And some of you want to make Mr. Taylor and the "teacher" heroes. Well, sorry, but I don't buy it. You don't get to stand up for the rights of gays by stomping all over the rights of non-gays, and you don't get to use the classroom to cram your own personal moral beliefs down the proverbial throats of high school students, and you don't get to protest for gay rights simply because you are gay. Check your facts next time, Mr. Taylor, and make sure you know what really happened before you start your protest. This was never about gay rights, nor was it intended to be, until McDowell forced gay rights into it. Tue, Nov 23, 2010 : 6:54 p.m.
Robyn, I disagree. Try to imagine yourself as a closeted gay student in a HS class in Howell. Now imagine a student with a confederate belt buckle stating "I don't accept gays", and having the teacher just let that stand. Or having the teacher grant the student a right to his/her "opinion" as if we were talking about what's for dinner. Sorry, no way.... "I don't accept gays" is a TOTALLY unacceptable thing to say in a classroom, and to have the teacher in any way make it seem acceptable is in fact creating an atmosphere of fear for that gay student. What does it MEAN to not accept a gay person? Not accept them how??? What would it mean to state "I don't accept black people"???? So what do you do with them? Lynch them? See the fear it creates, the hatred it espouses? This teacher was completely right in his strong stance, and I support him entirely. Tue, Nov 23, 2010 : 6:35 p.m. I think people are confusing what took place at that school with the message given by Mr. Taylor. Unfortunately - because of Graeme's statements at the school board meeting, people mistakenly believe that a teacher was standing up for gay kids that were being bullied in his class. That was NOT the case. There was no bullying in that classroom by any students. There was no hate speech toward gays. The teacher bullied the student and made rude remarks about the student's religious beliefs. While it is great to applaud Graeme Taylor for his advocacy on behalf of other kids - who like himself - are gay. The teacher he spoke about when he made his statement was NOT the teacher that was the subject of the board meeting - and the issue at hand was NOT addressed by Graeme. You can support this young man and acknowledge his message - but please don't confuse it with the issue that brought him into focus. Tue, Nov 23, 2010 : 5:13 p.m.
Tue, Nov 23, 2010 : 3:45 p.m.
@ scoobysnacks: "the story should have read: Scholarship given to student who supports..." So what? A private company and an entertainer provided a scholarship using their own money. You are free to do the same for any number of people and causes you find moral and worthy. Tue, Nov 23, 2010 : 3:36 p.m. Many thanks to Graeme for advancing our society one step further towards being a society of tolerance and acceptance of all people for "who they are" as opposed to "what they look like or their sexual orientation". As Graeme so eloquently quoted in his speech to the Howell school board from Dr. King's speech, "to be judged for the content of their character and not the color of their skin". What a great way to illustrate his point last week. We're proud to know you Graeme. You said last week that Jay McDowell did an awesome thing. Truth is, so did you! Your friends and their parents, support you wholeheartedly and we applaud your courage and the example you set for others! Tue, Nov 23, 2010 : 3:31 p.m. I'm with scoobysnacks, top cat and day13. It's not about being pro-gay or anti-gay. This teacher wears whatever he wants to class (and I think it is highly inappropriate for any professional to wear political or cause-related t-shirts to work) and then picks on a student who challenged him because he (the teacher) was bullying another student about an article of clothing that student was wearing. It would be comical if so many people weren't jumping on the bandwagon in support of the teacher. But because this teacher is pro-gay - hey, he can do whatever he wants?! As one parent said so well, if the teacher had behaved in this manner for a cause that does not have widespread liberal support, the behavior would not have been tolerated by anybody. Here we have a teacher who claims to be against bullying, but who first bullies one student (on something that had nothing to do with being pro-gay or anti-gay) and then bullies two others who had the courage to stand up to him for his actions against the first student. I hope they fire him. Tue, Nov 23, 2010 : 3:18 p.m. The facts of the original classroom incident are still so muddled that I don't see how anyone can call the teacher a hero of any kind. If as the students allege he kicked students out who expressed a religious position against homosexuality, I can't believe that doesn't violate something in the district's code of conduct for teachers. If the students expressed that view and were disruptive to classroom decorum in doing so, that's one thing. If the teacher dismissed them SOLELY for expressing that opinion, that's wrong and should not be celebrated. The teacher's role is to foster critical thought and to encourage students to consider and respect other viewpoints, not to impose any particular viewpoints. Tue, Nov 23, 2010 : 3:16 p.m.
Thumbs up on your last comment Scoobysnacks. Your proposed title would be too long though and require too much thought. Most followers of the "drive by" media only like stories that promote PC thinking that are conveyed by short sound bites. Tue, Nov 23, 2010 : 2:38 p.m.
scoobysnacks, How so? Please enlighten. And provide an answer to liekkio. Top Cat, An agenda topping the truth? Imagine. Where have we seen that before? Trickle Down? WMD? The war on Christianity? Taxed Enough Already when GE and Exxon pay no tax and billionaires pay little or no tax? I could go on. If the teacher "lost it", it was because the ignorance and intolerance that pervades our society can be overwhelming at times. Tue, Nov 23, 2010 : 1:28 p.m.
Tue, Nov 23, 2010 : 12:52 p.m.
"...but to get money because you 'think the right way' seems to be sending the wrong message to the youths of America." Providing a scholarship to a high school student like Taylor is a vast, vast improvement over awarding higher ed grants or loans to the usual idiot kids who like to complain about how everything that annoys them is "so gay." This is also a pleasure to watch on account of the actions of the Howell school board. It's delightful to bear witness as the board's attempt to conduct media spin, complete with its character hit job on McDowell, continues to spiral out of control and blow up in its face. And it's gone national as well. Tue, Nov 23, 2010 : 12:36 p.m. Anyone who thinks the students in this situation were the victims must be bigots themselves. Graeme and the teacher are sending a message of love and acceptance of their fellow humans. The students stand for hate and intolerance. The teacher may or may not have handled the situation with the utmost in professionalism (Do any of you really know?) but if he did "lose it" I wouldn't blame him considering the ignorance he was left to deal with. How ignorant do you have to be to not realize the difference between the Confederate flag and the Gay Pride flag? All of you supporting these students and maligning Graeme and the teacher should be ashamed of yourselves. Tue, Nov 23, 2010 : 12:30 p.m. Some people just don't understand the difficulties and prejudices one must face when growing up gay. We see and face things that a majority of society can not possibly imagine. Some may say it's a choice, but than why would anyone consciously decide to face daily ridicule and threats on their life? I was in high school... when Matthew Shepperd was murdered and tortured, that was a very scary time for me. It has forever touched my life, it tells me if you want to live in peace than hide who you are. Is that the message we want to send to our children? This kid and teacher should be commended, in my eyes their heroes. Tue, Nov 23, 2010 : 12:02 p.m.
@ scoobysnacks: you are certainly welcome to your opinion at least to the same degree as Ellen and tonic.com are welcome to theirs. The only difference appears to be that they put their money where their mouth is. Tue, Nov 23, 2010 : 11:54 a.m. I'm glad the kid got a scholarship. He is a well spoken young man - and a very good advocate for gay and lesbian kids. Face it - someone their own age is far more 'relatable' than some adult that says they know how it feels to deal with being a teen and being gay. Like some one who went through it 50 years ago (all adults are OLD to a teenager) undrstands what it's like NOW. I want this kid to get an education and do something great with his life - whether that means continuting to advocate or just being an example for other kids... That said - he spoke out in Howell - and the message he gave was not really the issue in that incident. Never the less - he got a message out and that's important. Tue, Nov 23, 2010 : 11:33 a.m. He received this money speaking about a teacher who did the wrong thing, but hey, its ok, because the teacher believes in gay rights over anyone elses rights. Sorry Jessica Webster, this 'articluate' young man received this scholarship because he is gay, not for what he said. The two students that were wrongly kicked from this teachers class are more worthy of the scholarship than this kid. The two students were the ones wronged here. Wake up. Tue, Nov 23, 2010 : 11:31 a.m. Very proud of you Graeme! And good for Ellen to be the conduit for a scholarship. This kid gives me great hope that maybe in my lifetime, we will all have equal rights in this country. Tue, Nov 23, 2010 : 11:27 a.m. This is such an incredible young man! I am very proud of Ellen and Tonic for recognizing him in this way! It takes a lot of courage to stand up to a bigoted school board. Way to go Graeme! Tue, Nov 23, 2010 : 11:12 a.m.
As the facts have now come to light, it would appear that young Mr. Taylor got his money based a misrepresentation of what happened in the classroom. This does not make him or Ms DeGeneres admirable. Apparently an "agenda" has trumped the truth of the matter. Tue, Nov 23, 2010 : 10:55 a.m.
xmo, Who (you) gives money to people who think the wrong way? A2anon, If I prayed, that would be my prayer! Tue, Nov 23, 2010 : 10:43 a.m.
xmo, ever since the supreme court reversed campaign finance laws and allowed the extraordinarily wealthy conservative republican machine to purchase elections without limits or transparency, it has become glaringly obvious that those with the most money generally get their way. To give a young man a college scholarship based on his courage and grace..... well, let's just say, don't worry -- the other guys have zillions to this 10K. Tue, Nov 23, 2010 : 10:32 a.m. I am glad he got money for college but to get money because you "think the right way" seems to be sending the wrong message to the youths of America. Tue, Nov 23, 2010 : 10:29 a.m. Kudos to Graeme and to Ellen. He's a brave and articulate young man. It speaks well of his character that he was willing to take a stand. Tue, Nov 23, 2010 : 10:27 a.m.
Lord, I give thanks to you that our world is filled with people who have graciousness, love and acceptance in their hearts; people who are generous with their resources and support promising youth; and that those who feel as scoobysnacks does do not make all the rules. Tue, Nov 23, 2010 : 10:01 a.m. Remember this is Howell. Past home of the Michigan KKK etc. Some things just don't change. Tue, Nov 23, 2010 : 9:44 a.m.
ABSOLUTLEY DISGUSTING! We have millions of families who cant afford a thanksgiving dinner and/or are homeless, yet ellen gives a $10,000 scholarship to a gay 14yr old like he's a hero? he is no hero and he was wrong for supporting the yelling, door slamming, name calling, out of control teacher! giving a $10,000 donation to an organization that gives out thanksgiving dinners or to a homeless shelter would have been respectful. Tue, Nov 23, 2010 : 9:21 a.m.
Maybe i missed it in other stories, but that was the first i heard about him being a part of a group with the neutral zone caravanning to Howell. I thought it was more like he spoke with his parents and decided he wanted to do this on his own. Seems like parts of the story were missing from the "Ellen" segment.